Microsoft surprisingly released Project Honolulu that we recently wrote about here and here, under a new name – Windows Admin Center. This sounds good, but not only sounds, we like this project so much that we decided to write and promote this product once more time. What is Windows Admin Center and why we like it so much? Well, We like product which is useful for admins, products which are fast, enjoyable to work with, and innovative. Windows Admin center (previously called project Honolulu) has all this. 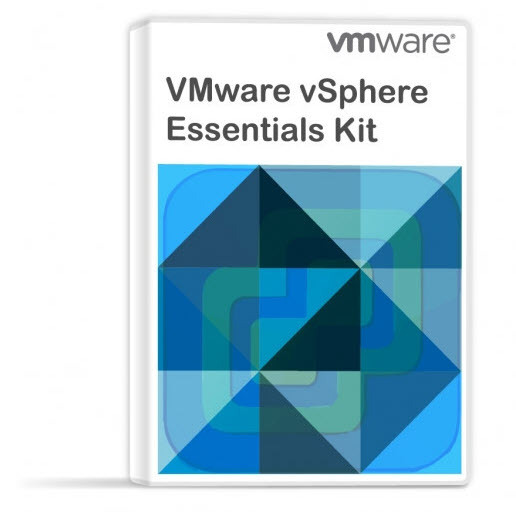 It is flexible, lightweight browser-based locally-deployed platform and solution for Windows Server management scenarios for troubleshooting, configuration, and maintenance. 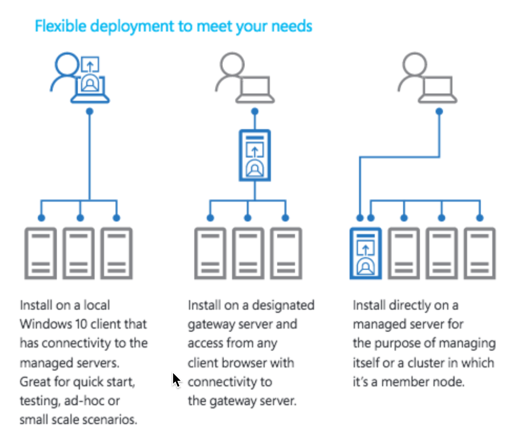 The Windows Admin Center gateway, when published to DNS and given access through corresponding corporate firewalls, lets you securely connect to, and manage, your servers from anywhere with Microsoft Edge or Google Chrome. Traffic from the browser to the Windows Admin Center gateway uses HTTPS. 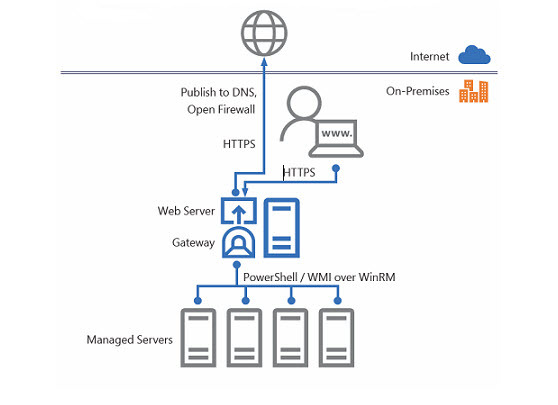 Traffic from the gateway to managed servers is standard PowerShell and WMI over WinRM. The tool, provided as MSI package, is installed in few minutes. It would be useless to provide screenshots from the installation as it only takes few min to install and the only option you have is the port number, which you can customize, in case you’re running something else on that particular port. In the lab, I installed it on my management workstation and connected remotely to some of my Windows Servers. Here is my remote connection to my Hyper-V host with 1 Test VM…. As you can see, while GA, the tool has still “More to come”… and future releases will have more features integrated in it. 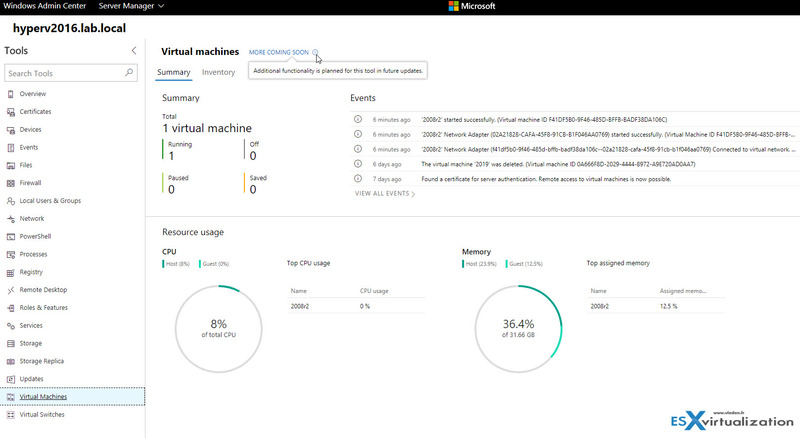 Windows Admin Center is designed for managing a single server or cluster. You can also manage Windows 10 machines with it. It complements but does not replace existing Microsoft monitoring and management solutions, such as Remote Server Administration Tools (RSAT), System Center, Operations Management Suite, Intune, or Azure Stack. When you click on the gear icon on the right-top, you can click on the Extesion manager to see an overview and future. There is already one extension (in preview) from Microsoft, but I’d imagine the whole ecosystem of partners jumping in and providing their own extensions and plugins, as well as huge Microsoft community. This will succeed, don’t you think? It’s certainly a very nice tool which might become the one moving forward, instead of those 20 consoles which every admin uses right now to manage Windows servers. In addition, the system allows managing Windows 10 computers, which are more and more present within the enterprise. For admins which are using System Center, the Windows Admin Center is complementary to System Center, but System center as such is not required. Excellent article! Do you know if Microsoft offers an API on the Admin Center for automation?